Last week on Dave’s “What to Sell on Amazon” series, I covered Weight Lifting. And I’m not afraid to admit… it was mostly a big ol’ dud of a category. But this time I’ve got a request from one of our readers: sewing! And I actually found a killer product right off the bat! So let’s dive in and see what’s up with sewing products! 168 average units in sales per month. Demand is low, but that’s okay. The one I’m really interested in is the 4-pack priced at $87.96 that’s doing 113 units per month on 5 reviews. By the way, always make sure you check the history of products. You can do that by clicking on the Jungle Scout Chrome Extension Pro’s sales figures. Or you can also get the free Keepa Chrome Extension, which puts a neat little chart directly onto your Amazon page. 33 average reviews. I had to take out a lot of outliers, but interestingly, none of them were like the product I’m interested in. However, with the outliers still in, reviews were still below 200 and the opp score was still a 6. FBA fees are showing $2.99. What’s wild is that the $87.96 product’s fees are only $2.99. I thought our system might be broke for a second, but I confirmed it with Amazon’s own calculator! Amazing! Okay, so there’s a lot of exciting things here. I’m mostly ignoring the other rulers and focusing on the one that comes with a four pack. Sure, its sales are lower, but it has crazy cheap fees, it’s selling over 100 units per month, and it’s doing all this with only five reviews. If we’re going to make quilting rulers, we’re going to want to copy this business model for sure! They’re a little higher than I’d guess for their size (it’s probably the design specifics and metal edging), but I think we could probably get away with getting a nice four-pack for $10 per set. Keyword Scout says we’ve got to giveaway 16 per day to compete. So we’ll need at least an extra 160 units. Sales are a little slower, here, so I think with three months of inventory plus our giveaways, we could probably start things off with this product for just 500 units. While they’re light, they are a little larger than the typical Amazon product. Checking OnPallet.com for how many can fit on a pallet, I’m seeing that we can put 336 of these onto a pallet. So we’re going to need at least two pallets. In my experience, two pallets comes out to about $1,800, but you might try to get a quote from Flexport first. “Dave! Are you crazy??? $14.20 per unit?!! ?” yes, yes. The price seems kinda high. And I’m not going to lie, it totally is. I usually don’t recommend starting off with that much in inventory. It’s a good way to lose money if the product fails, which at the end of the day, some products could. So you might consider doing a Kickstarter or Gleam campaign to launch it. So if we sell our bugger at $87.96, Amazon’s going to take out $16.19 (15% referral plus $3 in FBA fees). The keywords for quilting rulers are showing as $0.77 and $0.59 for exact and broad respectively. Using our 2.5 rule, that means we’ll pay somewhere around $7.70 for exact ad campaigns and $5.59 for broad. Note that higher priced items tend to have lousier conversion rates, so there might be a bigger swing in ads, but at such low rates for ad clicks, I can’t imagine ads coming out to more than $15 per sale. That means we’re left with $42.57 in profit. Let me repeat that… $42.57 profit per unit. Holy guacamole! That’s a profit margin of freakin’ 48% after ads, fees, and costs! And we’re selling over 100 of these per month, which equals nearly $4,200 in profit. Verdict: Expensive to get into, but the possibility of a MASSIVE first year return on investment of 809% ($50,400 potential annual profit divided by $7,100 start-up costs). This product is a potential winner. 38 average reviews. Took out some outliers, but not too many. Most of the ones I did were high reviews, but their sales weren’t too different than the lower-review items. Average price is $7.73. Here’s where the real headache comes in. Very very low price! 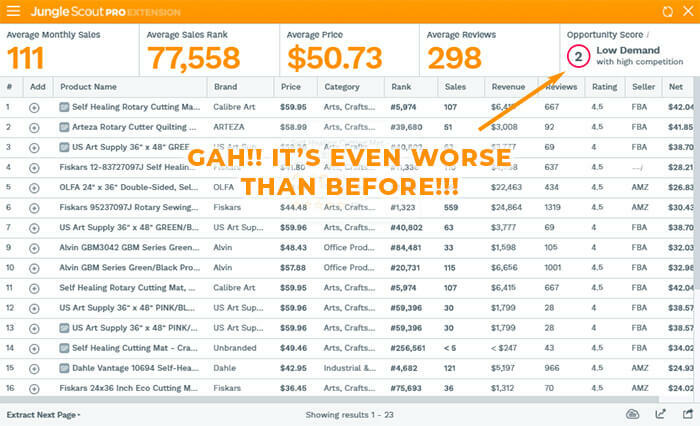 When you’re looking for what to sell on Amazon, it’s easy to overlook the average sales price and just look at the average sales and reviews. But average price is just as important. Because if your price is too low, you won’t be able to do any kind of advertising. Regardless, let’s see if it’s possible to compete at all. Good news (kinda). These are cheap to source on Alibaba. Looks like less than $1.00 per unit. And they’re going to be light and small, too, so they’ll be easy to ship. Probably can do them by air, too. And air freight is usually about $90 per carton. So if we can get 200 in a carton, we’ll probably spend about $0.50. So let’s say our total cost is right around $1.25. Super cheap right? Let’s do some math before we jump into calculating an order. At $7.75 average cost, we’re going to spend $1.25 of that on the unit itself and then another $4.15 on Amazon’s fees. So that leaves us with only $2.35 for profit and ads. Interestingly, there’s no info for ads. This might be because, frankly, nobody’s really advertising for the category, or not enough for us to collect information. Using the 2.5 Rule, I can tell you that there’s just no way you can do ads for $0.20 each. Even at that rate, it’d eat up nearly all of the remaining margin. So you’re going to need almost 100% organic traffic to your product. And the best way to do this is with giveaways. Keyword Scout says that we need to giveaway 8 units per day to succeed. Not too shabby. That means we’re going to need to start off with +80 more units. Average sales are nearly 200 per month, so that’s a total of 680 units. Back to the equation, notice that we had to get an art fee in there too (curse you art fees!). Those are usually only one time, but they’re still going to eat up some of the pie to start. $7.75 minus $1.69 minus $4.15 leaves us with $1.91. That’s super duper slim. If we’re off by even a small amount, we probably won’t profit at all. Verdict: Okay, yeah. This is a cheap product to get into. But it’ll require some serious hustling and work to get to the front page. I’ve slated us for 80 units, but it might take as many as 300+ to keep the energy going. I recommend doing something with a higher price point. This product is so-so. 366 average units in sales per month. Great sales! 442 average reviews. Argggh! Deja vu! Mega high review counts across the board. Plus, plenty of big ol’ brand names here, too (I actually own the Fiskar’s cutting board haha). Average price is $30.89. The average price is fantastic though. Unfortunately, I think it’s mostly skewed by the super duper large versions which mean high fees and shipping costs. Similar to many of the products I found on weight lifting last week, this product has some mega-competition. Even removing outliers wouldn’t leave a whole lot of breathing room. When you’re dealing with competition like that, it’s almost impossible to get a sale in edge-wise. Still, maybe there’s some opportunity with the high end models? Before we even price it out on Alibaba, let’s consider a few factors. First, the most expensive products on this list are usually larger sized–48″ x 36″. For reference, that’s the size of a small dining room table. Huge, right? Those are priced at $40-$60 on Amazon. Trouble is, before we even worry about costs, Amazon’s going to take $12.26 in FBA fees plus another $9.00 in referral fees. That puts us at roughly $40 for costs, ads, and profit. And even filtering out all the “cheaper” options, there’s still tons of reviews to compete with. And less sales to do it! Fortunately, ads aren’t too bad. Keyword Scout shows that we can get ads for this particular set of keywords for $0.40 and $0.20 for exact and broad respectively. I’m guessing conversion rates are lower for the big boys, but even at a 5% conversion rate, ads will cost us $8.00 tops. So now we’re left with $32 between cost of goods and profit. Time to turn to Alibaba. $33.00 – $35.00 per unit?!?! Uhhh, pass. HARD PASS. That’s not even including shipping. But for gits and shiggles, let’s estimate shipping real quick. These bubbas are probably like… 30-40 per pallet. We’re going to need at least 500 of them, right? So that’s going to be 8-9 pallets. Even at a bulk discount, we’re talking about $450 per pallet, so another $10+ per unit. I think we can call the time on this. Verdict: too much competition, way too expensive. It’s a loser. 152 average units in sales per month. Decent sales. But I had to get rid of a lot of funky outliers to get there, mostly machines in the same category. 25 average reviews. Cricut and Martha Stewart have a lot of this category on lock down. I’ve removed them from here, but there’s a whole lot of <5’s on this CE look. Average price is $17.53. Note that the more expensive versions of the product don’t do so hot. So shoppers expect a certain price range, mostly in the mid-teens. I really really wanted to find a cutting board that worked, but it’s not looking good so far. But maybe we can find some profit here? 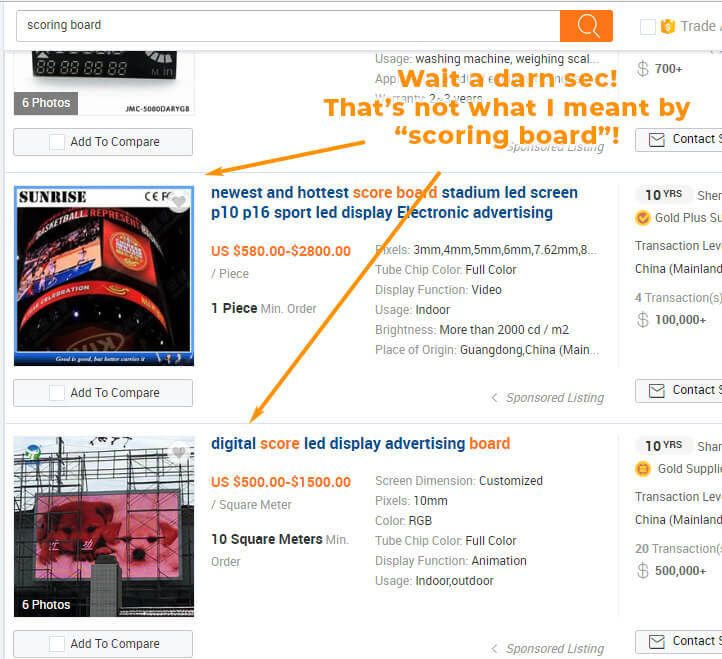 Let’s head back over to Alibaba and see what’s up with scoring boards. Right away we can see an issue here. Instead of boards for scoring with a scoring tool, we got scoreboards. That’s not what we meant! And sometimes that happens with Alibaba. So we’re going to need to find a different way to search. 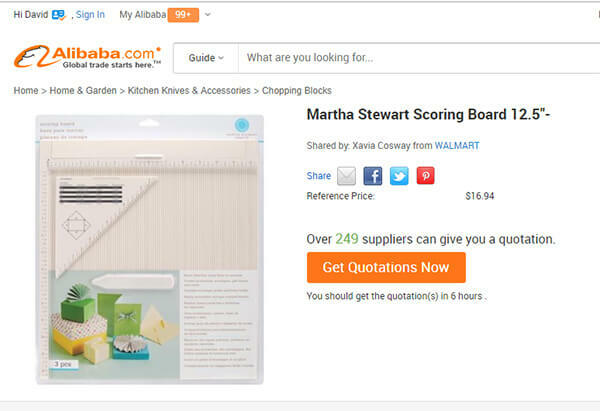 So instead, I went through Google and did a search for “scoring board Alibaba” hoping that Google’s search engine worked a little better than Alibaba’s. No quote yet, but it can get made. And apparently, it can get made by a lot of suppliers–supposedly 249. So I’ll have to put in a request for quotation (RFQ) and see what comes back. 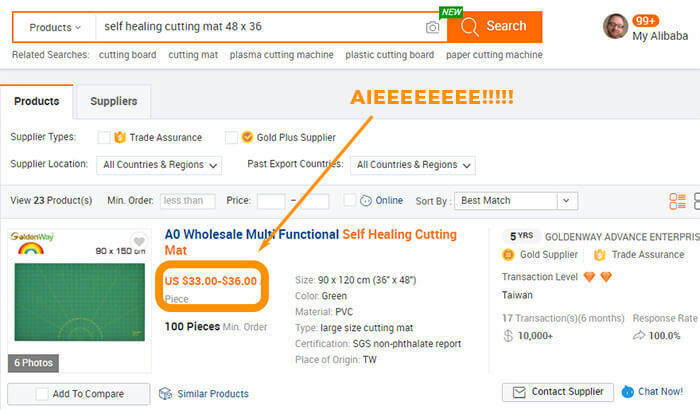 One thing to note is that the harder something is to find on Alibaba, the higher the barrier of entry. ’cause if it’s hard for me, it’s probably hard for others, too. So that could end up being a good thing! 93 average units in sales per month. Ew, kinda low. But! On the plus side, looks like everyone on the first page is at least doing a little bit of sales. Even if it’s not great. 29 average reviews. Only 29 average reviews! And I didn’t even have to remove anything. Average price is $13.63. Unfortunately, average price is pretty low. So we might have an uphill climb there. Okay, so there’s some good things with this one. I won’t rule it out yet. I do like that it has low reviews. There’s definitely a correlation between high review counts and sales; the one pictured has 96 reviews and nearly 400 monthly sales. Because there are a lot that do this by weight vs by roll, it might take some calculation on your part to get a final cost. However, I was able to find a couple manufacturers that did offer it by the roll. Surprisingly, the cost isn’t too high on these. It looks like it’s going to be roughly $1.50 – $3.00 overall. They’re small items, so shipping should be easy on us, too. The pictured product measures 6″ x 3″ x 3″. OnPallet shows us we can fit over 2,000 of these onto a single pallet! We’re probably not going to see a whole lot of sales to start. I’m guessing around 100 per month if we’re good with our PPC and promotional campaigns. Keyword Scout says that most of the best keywords tied to “lace fabric roll” need 5-8 giveaways per day. So we’ll tack on another 80 units for good measure. That’ll put us at roughly 400 rolls. I’m guessing we can probably air freight these in for about $200. All right, so let’s say we price our product a little bit lower than the top competitor: $15.99. Amazon’s going to take 15% of that plus $2.99 to fulfill it and then we have our cost of $3.25. That leaves us with $7.35. Looking back up to graphic above, notice how I outlined how ad costs were pretty low across the board? We could probably get away with spending only a few dollars on ads; let’s say $4.00 just to be safe. Of course, that doesn’t leave us with a whole lot of profit. Only $3.35. Verdict: pretty low profit margins on this. If there was a way to get costs down (ordering higher volume or combining rolls) or prices up, it might be worth doing. This product is so-so. That’s it for this week! One heckuva winner this week with the quilting ruler pack, and a few others that might be worth considering with the right angle. Mark your calendars! Next time I cover another request: daily planners and agendas. That one should be fun! If you have any questions, feel free to email me direct: [email protected]. As far as we know, it’s still okay to do. The one thing Amazon doesn’t want is people giving away free products for reviews. We’ll keep you updated if we hear different! I’m sorry – I am confussed. Outliers – do you take them in or out. I take them out. I like to see how products fare if they don’t have the same quantity of reviews as the big sellers. Sometimes, the sales are fine, which is also a sign that there’s variations that can still be made. Other times, especially in incredibly competitive categories, there’s a marked difference between high review count products and low review count products.